Late last year, Microsoft booted out booted out its head of Windows, Steve Sinofsky. Now, a few more details have come out about his departure—including who Microsoft have banned him from working for. 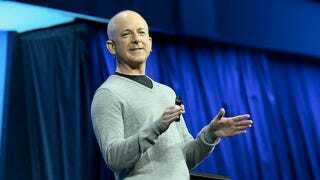 In a 10-K filing, it's revealed that Microsoft has said Sinofsky “cannot accept direct or indirect employment” with Amazon, Apple, EMC, Google, Facebook, Oracle and VMware. Until December 31st 2013 at last—a year on from his termination date.